“Your baby has a heart murmur.” Those were the words that began our journey with Children’s Hospital of Pittsburgh of UPMC in 2007. We are a close family, brought up with a strong set of values created over time with the experience of lifetimes to solidify all that we believe. As our family grew, we understood that these values meant something more than just doing what was right, doing what was expected. It meant creating a future for our children and filling them with humble self-reliance. We thought we were done creating children and settled into the daily pleasure of raising them all. As with the best laid plans, we realized that there was to be one more baby as our grand finale. We joyously prepared for his birth with confidence that comes with practice and felt more than ready to bring our son into the world. When he was born without much fuss or drama, we were ready to do what we did best: marinate him in love and family. Within hours, our dreams were disrupted, our unshakable values were shaken … our baby was not perfect and never would be. He was diagnosed with several heart defects that when combined, fell neatly into the diagnosis of Endocardial cushion defect. He had issues with the size of his heart and problems circulating the blood within it. He began to shows signs of Congestive Heart Failure and struggled with breathing and eating at the same time. He was born in September, a hefty 10 pounds 12 ounces, but by December of that year, he had only gained 3 pounds. It was time for his first surgery, and I was broken thinking of all that would mean for my defenseless baby. Anguish, fear, defeat, anxiety… there just aren’t enough words to describe how I felt knowing that I could not prevent any of this for our little boy. Watching him struggle to just breathe and not being able to help him was heartbreaking. We met with Dr. Victor Morell, chief of the Division of Pediatric Cardiothoracic Surgery at the Heart Institute at Children’s Hospital, and his surgical team and had time to ask as many questions as we could think of. We met with the office staff and were told to call anytime with any questions. Dr. Linda Russo and the cardiology team were at our service with updates from the Heart Institute and upon my request, I was permitted to speak with another mother who had been through this with her own child. We felt the compassion and empathy from each member of the Heart Institute Team, but, mostly from Dr. Morell. He was gentle and precise as he examined our baby boy. He told us of his own experiences with his children and made me understand that although this man was a world-renowned expert, extensively trained to work on the tiniest of hearts, with the most complicated problems, he was also a father. My baby would be safe with him and he would do all he could to return our little one back to our arms. 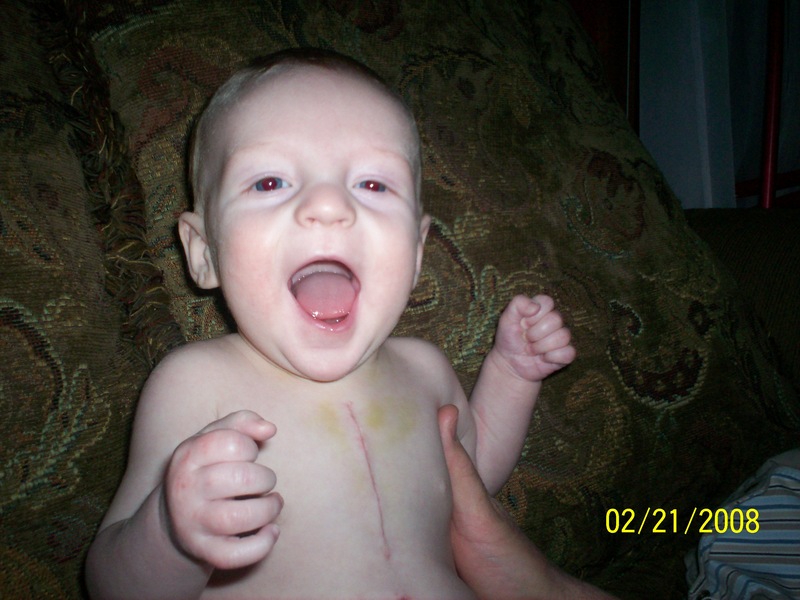 David had his first open heart surgery on Feb. 7, 2008. I remember every moment of that day and the grueling days that followed. As he progressed along the convoluted path of recovery, time passed quickly and with each day, month, year that followed, we were given the gift of loving a beautiful, active, precocious little boy. His symptoms were quiet, and his doctor visits gradually spread out to a plan of just once a year. He did so well, but on his three-year exam with Dr. Russo, his echocardiogram results showed that the hole in his heart had returned. He was once again shunting the flow of blood in the wrong direction, and the size of his heart was becoming larger. My only thought was “Again? No not again!” In spite of every objection I could think of to keep this from happening again to our little boy, it was happening…again. The only positive in this second time for him was that he was not having any symptoms yet and would be going into this surgery as a 40-pound 3-year-old boy instead of a fragile 13-pound, 5-month-old. They would only be fixing the persistent ASD or Atrial Septum Defect and this time, they would use a synthetic material designed to grow with him and become part of the anatomy of his heart muscle as he grew. The plan was to proceed with his surgery in October 2010, five months away. I would have time to continue to fatten him up and in October the rest of the children would be in school and occupied throughout the day. As the days of summer passed and we adjusted to this new plan for our little boy, my 12-year-old son Nathan began to complain of migraine-type headaches now and then. These headaches were similar to those of my father-in-law and I medicated Nathan for his symptoms and tried to identify the common causes of migraines: dehydration, sleeplessness etc. As we neared the end of that list, the headaches became more focused behind Nate’s right eye. When I came home from work to find Nathan with an ace bandage wrapped around his right eye “to keep it in Mom, it feels like its falling out,” I began to panic just a little. I made an appointment with our optometrist who then sent us to our pediatrician. Within minutes, he had the office make Nathan an appointment with Dr. Bilal Sitwat, a child neurologist in the Brain Care Institute at Children’s, the next day. I was officially frightened by then and trying desperately to hide my fear from my son. With the constant worry for David weighing heavily on our family and now the unknown invading our family again with another of my children, we were all strained to breaking with tension. As he went through the tests to determine what he had, a tumor… a cancerous tumor was high on my list of things to worry about. 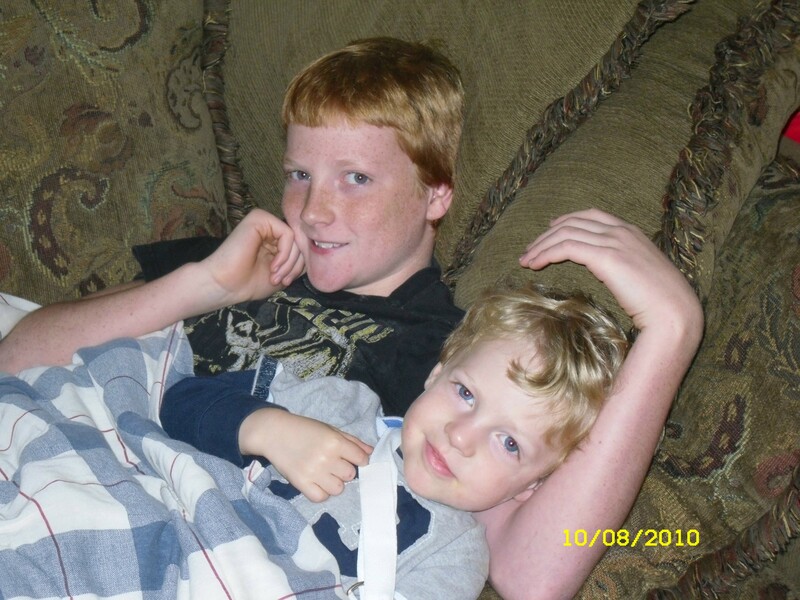 When we met with Dr. Sitwat and were told that Nathan had Moya Moya syndrome, a very rare cerebrovascular disease that affects one in 4,000,000 and usually female children of Asian descent, I looked at our gentle, red-headed, freckled, blue-eyed boy and wanted to fall to pieces. How could this be happening to our family? What was next? Wasn’t one sick child enough? We met Dr. Stephanie Greene, a pediatric neurosurgeon with the Brain Care Institute, shortly after that and learned that with each trial we faced, there were blessings to help us along the way. Dr. Greene had her hands full with a nearly hysterical mother and father in her office. We asked and she answered each and every question we could think of. In retrospect, I think it was her smile, her hand on mine, her calm confidence and competence that finally got through to me. She would fix this with a surgery called pial synangiosis. She would help take Nathan’s pain away. I felt that in every fiber of my being. We were right where Nathan needed to be. Nathan had the cerebral angiogram on a Thursday to determine how far the disease had progressed and found that Nathan was in grave danger for stroke or hemorrhage from the damaged vessels in his brain. 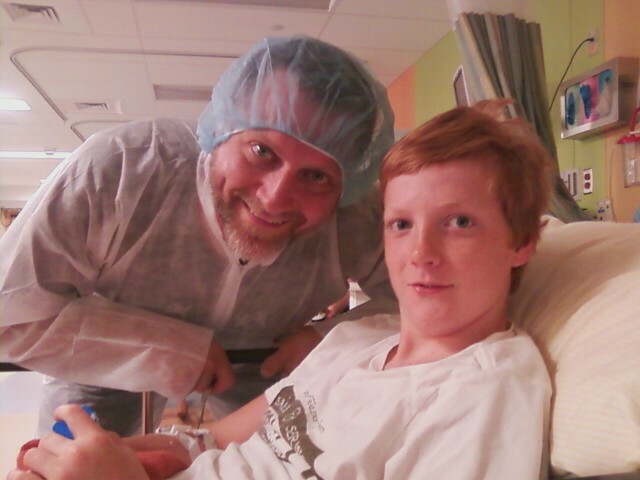 They scheduled his surgery the following Tuesday … one week before David’s … in October. As a veteran critical care nurse, I watched with a critical eye, making sure all hands were washed, all equipment was clean. I know that in spite of my overbearing vigilance, and desperate need to control something … anything, the nurses were patient and attentive to each detail of both David’s and Nathan’s recovery. I had a difficult time stepping back and being a mom, instead of a nurse. I don’t imagine they had an easy time with me there watching each and every move, yet all were gentle with me, and more importantly, gentle and efficient with Davie and Nate. There is a world of difference between brain surgery and open heart surgery. There were so many minutes, hours, days, and weeks we spent watching our children in pain as they fought to recover. In the end, Nathan and David have endured and surpassed the expectations of their doctors. They are brave champions … heroes … along with each and every child afflicted with any medical challenge. I sat in the waiting rooms with other parents, all of us joined like soldiers, ready to go to battle with our champions to help them heal. I often wonder how each of those nurses handle the little patients they must care for and the adult parent patients they must soothe and comfort as they do what needs to done. It is a job I don’t envy them, but I can say with crystal clear knowledge how important it is to “Be Glad You Have Children’s”. Without them, my sons would not be alive.